3) a much more muted cycle of growth after the financial crisis and recession of 2007-2009. 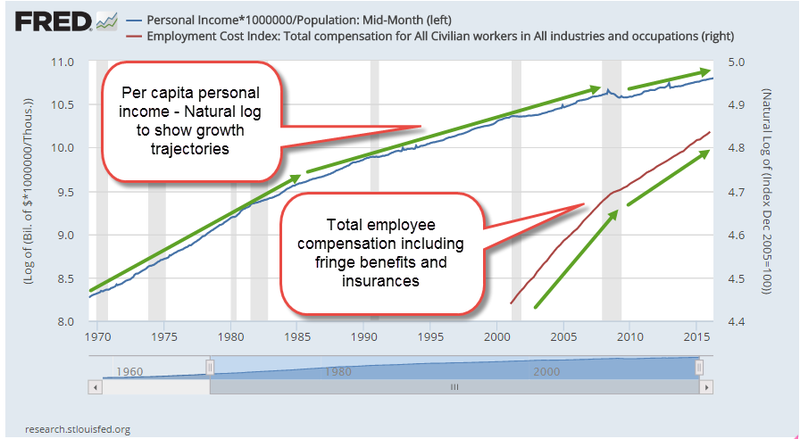 On the right hand scale is the natural log of the Employment Cost Index, an index of total employee costs calculated quarterly by the BLS. This series is only sixteen years old but it does show the steep growth of these hidden costs. Our government at all levels chooses to pay for social programs by sliding the costs under the rug. Politicians could tax everyone for the dozens of social support programs but Americans do not like paying taxes. As a rule, Europeans are more willing to make sacrifices for programs that benefit the group, although attitudes are changing as European populations become more diversified. People in general are less willing to pay into the group kitty when a society is less homogenous. In America, there are fewer protests when politicians add program costs to the total value of a paycheck where employees do not see most of the costs. Workmen’s compensation insurance is a good thing but would voters be willing to pay 5% of their pay for it? Maybe not. The law is written so that the employer pays it and the employee never knows the amount. The cost for workmen’s comp may be 10-20% or more in service and construction trades but only 1% for an office worker. Some people argue that such a disparity is appropriate; those who work in more dangerous jobs pay more into the insurance system. Employers are incentivized to create a safe environment for their workers in order to reduce costs. On the other hand, the health of workers is a public cost. If all employees were taxed equally, the danger premium would be spread evenly across all employees. Interest rates are near zero. One year CDs from major banks pay 1% or less. Interest rates have been falling since the early 1980s when savings accounts were earning an astronomical 12% or so. Interest rates are a price of sorts, the price a bank is willing to pay for someone’s savings. Lower interest rates = lower price = less demand for savings. So, people will respond to that lowered demand by putting less money in savings accounts and CDs, right? Wrong. As interest rates decline, people actually increase the supply of savings they want to give to banks. Why? It seems counterintuitive till we take into account that the population is aging, and older people tend to get more conservative with their savings. Secondly, a larger pool of savings is needed to earn the same interest income. So we would expect that “safe money” savings would increase somewhat in the past decade. However, the difference in the amount of savings is dramatically higher. 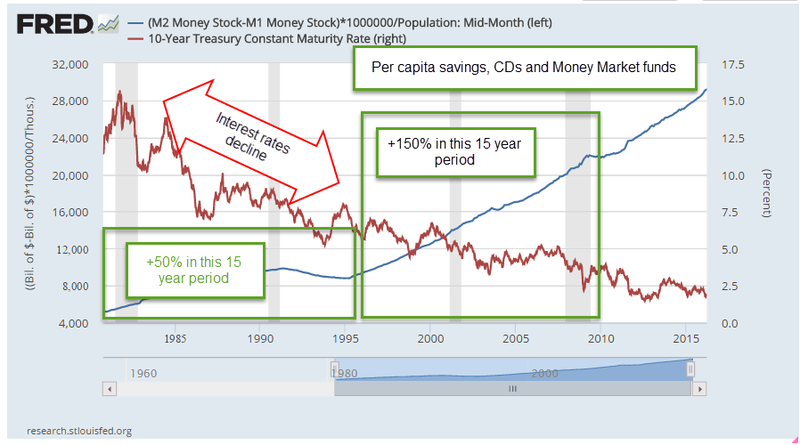 In the 15 year period from 1980 to 1995, Money Market, savings accounts, and CDs grew by 50% per person. In the subsequent 15 year period from 1995 to 2010, safe savings grew by 150%, triple the increase of the previous fifteen year period. By keeping interest rates low, the Federal Reserve is trying to force the public to take more chances with their money. Like the mule who resists going down a steep path in soft dirt, the American public stubbornly refuses to go where the Fed wants. It may take at least another ten years before Americans forget the financial crisis and are willing to take on more risk. The slow growth of this seven year recovery will persist until Americans lose their aversion to risk.